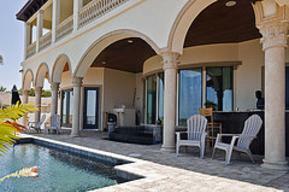 Tampa & Sarasota, FL Picture, Architectural, and Fixed Lite Windows: Choose Your Style and Look! PGT and CWS picture / architectural and fixed lite windows are used as standalone or to compliment companion windows to create a specific look or create a visual interest on your Tampa Bay or Sarasota home. 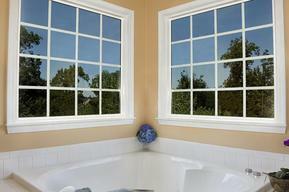 These styles of windows are fixed (non-operable) and allow maximum light transfer due to the fact they do not operate. These windows come in a variety of shapes and sizes and can be custom ordered to fit even the most unusual or non-standard window openings. In a lot of cases, a picture window will be used as a centerpiece of an opening with either single-hung, double-hung, or casement windows being used on either side to create a large, elegant look. PGT picture windows and architectural windows are available in High-Impact Hurricane versions which meet or exceed the High Velocity Hurricane Zone (HVHZ) Building Codes of Miami-Dade County, as well as options available in Non-Impact as well. For more information and a free estimate, contact Hurricane Windows & Doors today! NEW PGT 5400 Series Vinyl EnergyVue Windows are the non-impact rated version of the 5500 Series Winguard. Using an impact rated frame and PGT’s superior insulated glass technology, the 5400 Series windows are designed to handle wind speeds well above 140mph in most sizes, ensuring your home will be safe during high windstorms. This window is commonly used in replacement window applications where hurricane shutters have already been installed or will be installed by us. PGT 600 Series Aluminum Winguard Windows are the non-impact rated version of the 700 Series Aluminum Winguard. Using an impact rated frame and PGT’s superior insulated glass technology, the 600 Series windows are designed to handle wind speeds well above 140mph in most sizes, ensuring your home will be safe during high windstorms. This window is commonly used in replacement window applications where hurricane shutters have already been installed or will be installed by us.